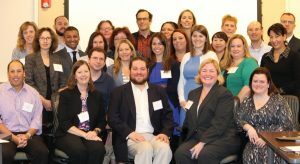 The legal department of Eisai Inc. launched its formal pro bono program in 2015 by hosting a Clinic in a Box® Program – Legal Audit. Eisai liked the model but was eager to provide legal services more aligned with its corporate philosophy of human health care (hhc) and help those assisted by their community advocacy colleagues, namely individuals impacted by breast cancer. Eisai’s pro bono leaders approached CPBO about adapting the model to provide individuals with end-of-life documents, which would require finding the right co-hosts and developing substantive materials from scratch. Fortunately, Drescher & Cheslow, McCarter & English*†, and Volunteer Lawyers for Justice had the expertise and the desire to join the effort and expand the model. 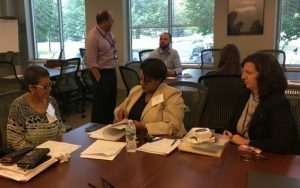 On July 20 at the Eisai legal department’s annual all-hands meeting at its headquarters in Woodcliff Lake, New Jersey, 24 Eisai attorneys and their colleagues provided 10 clients with wills, durable powers of attorney, and advanced directives for health care. As with any Clinic in a Box® program, the clinic started with volunteers receiving in-depth training provided by attorneys from Drescher & Cheslow and McCarter & English. After the training, volunteers broke into teams of two and three to meet with their clients to conduct interviews and, with help from attorneys from Drescher & Cheslow and McCarter & English, draft and proof wills, durable powers of attorney, and advance directives for health care, which were signed, witnessed, and notarized as needed to be taken home. Despite the tough subject matter both clients and volunteers expressed appreciation for the clinic. Of her experience, one volunteer said, “I feel this is an awesome program. I can see the benefit of helping and the outreach is awesome.” As for the clients, all were thrilled to receive the documents and as one client noted, the comfort of knowing that this was not something she needed to worry about any more. Congratulations and thank you to the co-hosts and volunteers. These clinics are not possible without your time, energy, and enthusiasm. ACC chapters and legal departments interested in hosting a similar clinic, can learn more at Clinic in a Box® program and read about previous clinics here. To discuss in-house pro bono, please contact CPBO.